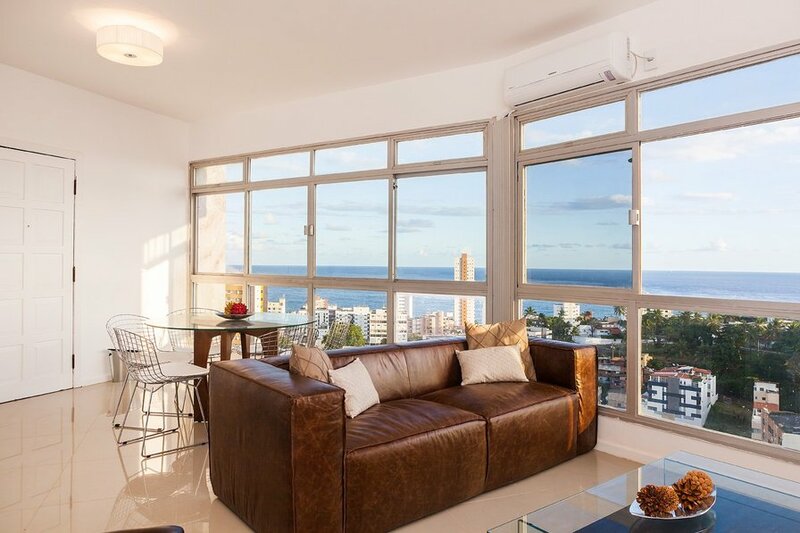 This beautiful, modern, air conditioned and spacious apartment in Barra and Graca borders has been recently renovated. Each room comes with a stunning sea view. The apartment views are a full 180 degrees and includes overlooking the Bay of All Saints. You are able to enjoy the fantastic sunsets over the bay from the apartment. It features a modern fully equipped kitchen, and other comforts include washing machine and dryer, TV, music player docking, air-conditioning and free wireless ADSL Internet access. This apartment comfortably accommodates up to 8 people. There are 3 bedrooms: 4 single beds and 2 queen size double beds. It has 3 bathrooms, a very large living room and a dining area with seating for 6 people. This apartment certainly offers everything to make your stay a comfortable one. Located in the district of Barra and on the edge of Graca it is also a 15 minute walk to the fashionable area of Vitoria. The apartment block is a few minutes walk from the beach of Porto da Barra. It has a convenient location near the city center. The Barra Lighthouse, Instituto Maua (handicrafts), museums, Teatro Castro Alves, Old Town, Pelourinho and Mercado Modelo are all very close and easily accessible on foot or short taxi ride. For guests wishing to enjoy Salvador's Carnaval they can easily walk to either Campe Grande or to the Barra-Ondina circuit. Also within walking distance are plenty of things to do in the evening such as cafés, cinemas, restaurants, ice cream parlours, night clubs, gyms and bars. Guests who prefer to make use of the self catering facilities at the apartment will easily find delicatessens, butchers, bakeries, fish mongers, supermarkets, shops and large shopping centres. There are all the other things needed to help you enjoy your stay close by, such as hairdressers, tour companies or guides, car hire, pharmacies and medical services.